KARACHI: Some clues picked up in the ongoing investigation into an Automated Teller Machine (ATM) skimming fraud point towards involvement of bank staff in the scam, State Bank of Pakistan officials revealed on Thursday. In a seminar held at the Institute of Bankers Pakistan to discuss the ATM scam and ways to prevent it, officials from the central bank said that banks were procrastinating on implementation of some guidelines regarding ATM safety. Head of payment systems at State Bank, Sohail Jawad noted that in November 2017 alone, some 100 ATM cards were compromised and around 37 million rupees were lost from 24 banks. The question remains, how were payments allowed on the compromised cards in foreign countries, he asked. The official lamented that in some situations, banks are slow to act upon important guidelines needed to prevent such fraud. 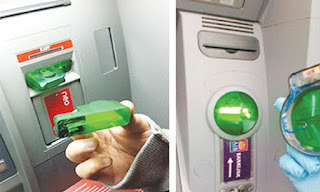 Sharing advice on prevention of such types of fraud, cyber security experts emphasised that customers should make an effort to hide the keypad with their hand while entering their ATM password. State Bank officials informed that a free SMS service would soon be introduced for all ATM transactions, so that customers are alerted if there is any unauthorised access. Earlier in December, it emerged that hundreds of citizens in Pakistan had lost millions of rupees over a couple of weeks after they fell prey to an ATM skimming fraud. An investigation was launched into the fraud when more than 500 customers of banks across Pakistan complained to the Federal Investigation Agency (FIA) regarding the scandal.